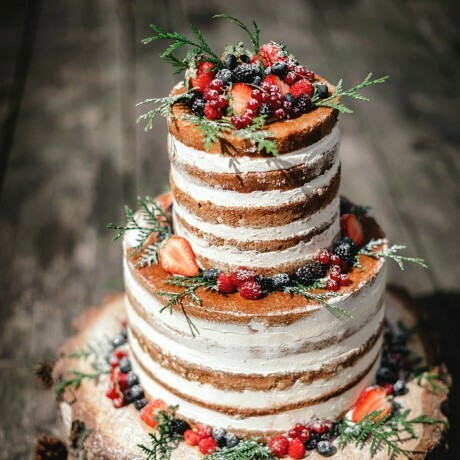 This rustic wedding cake will complement your style and its scrumptious taste is sure to add that unforgettable experience for your guests. The cake is evenly layered, filled with delicious buttercream and decorated with delectable fruits or lush flowers of your choice. There are also a variety of flavours to choose from to tempt any taste bud and add some more fun to the presentation including red velvet with creme cheese frosting, chocolate orange cake, chocolate cake with salted caramel, victoria sponge, carrot cake and lemon cake. The naked cake is a two-tier cake 10 and 8 inches which can serve between 70- 90 people. Please allow for at least 7 days notice in advance when ordering. You can select your preferred delivery date at checkout. This cake should be delivered on the day of your event because it needs to be as fresh as possible. Hand delivery within London is free, for deliveries outside of the M25 have a delivery charge of £50 please choose that delivery option at checkout. If you have any questions before ordering please use the "Contact the Maker" button on this page. Vanilla Sponge cake: Unsalted butter, caster sugar, Flour, Eggs, Madagascan vanilla Bean extract and icing sugar. Contains Gluten, Soya and Free range eggs. However gluten free and eggless cake options available. We use nuts in the kitchen- cannot guarantee nut-free products. This cake was ordered for my 50th birthday. This cake was ordered for my 50th birthday. It arrived on time and it was shared amongst my colleagues at the office. Definitely 5 stars for service and 5 stars for taste and presentation. These were bought as xmas presents so won,t know recipients reaction till next week, however, have bought these before and the verdict then was excellent.Service from ordering to receipt was also excellent. Will be coming back for more shortly. Best popcorn ever!Received as a gift and really enjoyed it. Not like any of those ones you buy in stores. These look lovely and are really eye catching. These look lovely and are really eye catching. We loved opening the box but they are rather tasteless. The icing is nondescript and the chocolate is dull. However, if you are looking for the wow factor without anything exciting on the eating side, they're great. This product is dispatched by DessertsVille London. This item has a shipping weight of between 20,000g and 20,000g depending on the options selected. Handcrafted, innovative edible works of art suitable for all occasions and weddings.